In 1865, when just twenty-five years of age, Edward Whymper achieved the fame of which he had dreamt as a teenager by making the first ascent of the Matterhorn, the last great unclimbed summit in the Alps. With renown came notoriety and lasting sorrow, though, due to the catastrophic accident on the descent, which cost the lives of four of his party. Whymper’s life was marked by the conquest of the Matterhorn, but his mountaineering achievements have overshadowed his distinction as a wood engraver and book illustrator. Before he had ever thought about the Alps, while a teenager fulfilling his apprenticeship in the family engraving studio, Whymper kept a diary for six years, detailing his daily life in Lambeth. Showing frequent glimpses of the dry and sardonic humour so characteristic of the older Whymper, the diary is written with a developing style which looks forward to his classic works on mountaineering, Scrambles amongst the Alps and Travels amongst the the great Andes of the Equator. Providing a rare picture of the workings of a wood engraving studio during the heyday of this reproductive medium, the diary also reveals the world of his father, Josiah, and those London-based artists seeking to make a living from their water-colour painting. 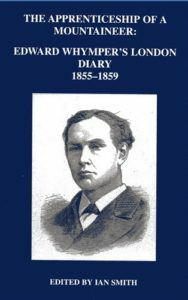 An avid reader of The Times, the young Whymper’s diary follows the events of the day – the Crimean War, trhe Indian Mutiny, the affairs of Parliament, notorious trials, business scandals – and also the many fires and daily catastrophes so prevalent in Victorian London. This edition reproduces the complete text of Whymper’s first diary for the first time. Ian Smith is a librarian, who is writing a biography of Edward Whymper. He is a member of the Alpine Club and has climbed many of Whymper’s first ascents. He is from south London and lives in Kennington.